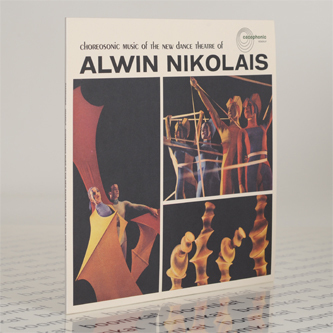 **The Finders Keepers bloodhound deserves a steak for sniffing out Alwin Nikolais' 1959 LP of recordings for dance** "Choreosonics was the name of the music for the choreography of Alwin Nikolais – a unique theatre exposition that was described in the late 50s as “the new theatre of shape, motion, light and sound.” In 1953 Nikolais attracted people interested in new art to his dance concerts at the Henry Street Playhouse in New York City. In these concerts dancers became colourful motivating sources for sculptural shapes; moving in changing atmospheres of light and sound their relationship carefully integrated into a new kind of audiovisual abstract theatre art. The sounds created for this were not conceived from traditional music points of view but were designed to share and support the total visual dynamics. Such a creation was possible because of Nikolais’ background as a musician as well as choreographer. At sixteen he was playing piano and organ for the then disappearing silent films, improvising and coordinating music four to six hours daily to the dramatic content of the movie. With this profession obsolete, he turned his skill into accompaniment for dance. Through this his interests led to his study of percussion accompaniment and exploration of new sounds. These ideas were stimulated by the kind of dance accompaniment introduced by the famous German dancer, Mary Wigman. This, in turn, induced Nikolais to study dance and ultimately to switch his career from musician to dancer and choreographer. Nikolais was soon heralded as one of the leading figures in modern concert dance, he is credited with bringing about revolutionary ideas opening up new vistas for dance and theatre. Nikolais’ activities were centered at the Henry Street Playhouse in New York. His work was created there with his assistant Murray Louis; sound engineer David S. Berlin; artist George Constant and members of his Playhouse Dance Company. All of whom had a hand in the final productions. Performances with names like Prism, Cantos and Totem were met with positive critical view for their multidisciplinary achieve- ments. While his collaboration with Harry Partch on The Bewitched established his name alongside another true maverick of American sound design and forward-thinking composition."